We remain in a state of mourning from the news earlier today regarding the terrorist attacks at two mosques in New Zealand resulting in the loss of lives. To God we belong and to him we shall return. The Apex Mosque condemns this and all terrorist attacks and continues making prayers and supplications for the victims and their families. The Apex Mosque has been in contact with the Apex Police Department and they have indicated that over the coming days, they will increase their patrol visibility especially during times of heavy masjid use. Building on our prior collaborative security efforts with the Apex Police Department and Apex Fire Department, we will be conducting additional facility evaluations with their input to identify additional security measures to further ensure the safety of everyone in the community. The FBI also remains in contact with the Triangle Muslim community and has currently indicated that they have not identified any threats to communities in the area, but are remaining engaged to ensure our safety. Should any community member have any suggestions or concerns, please do not hesitate in contacting us. During such difficult times, the Apex Mosque reminds its members to remain vigilant and take the necessary precautions to protect their families and communities. We encourage all members to speak out against all forms of hate and to continue forming bonds with the broader community. While these tragedies give us all pause, we should not be deterred but instead continue to fill our masjids with our presence with faith in the Almighty and love for one another. May God give comfort and healing to those who are suffering everywhere. To offset its carbon footprint and move towards a more environmentally friendly facility, the Apex Mosque is pleased and excited to announce its intention to install a solar power system in collaboration with 8MSolar and Duke Energy Progress. Once installed, this system will provide the capacity for the masjid to generate its own electric power thereby virtually eliminating its need to purchase electricity. Project planning has been initiated with a goal of having the system installed and operational by Ramadan God-willing. If any community member would like to be a part of this excellent project, online donations can be made here. Please select “Solar Energy Project” in the category drop-down menu. 8MSolar colleagues will be available in the lobby to answer questions from community members after the khutbah on Friday, 08-March. Apex Mosque is once again participating with other faith-based community organizations in in the Habitat for Humanity Interfaith Build 2019. 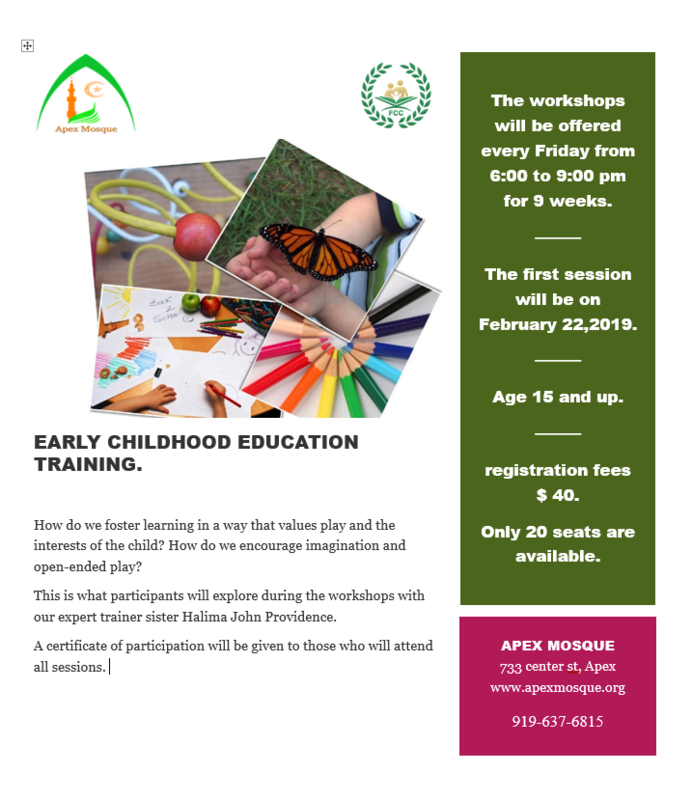 Apex Mosque’s designated house construction days include Saturday: 16-March (4 additional volunteers needed), and 06-April (4 additional volunteers needed) from 8AM to 4PM and will occur primarily in the Crosstowne subdivision in Raleigh. If interested, all volunteers must be at least 16 years old and are required to register. Please contact Br. Asif Ansari for registration information. 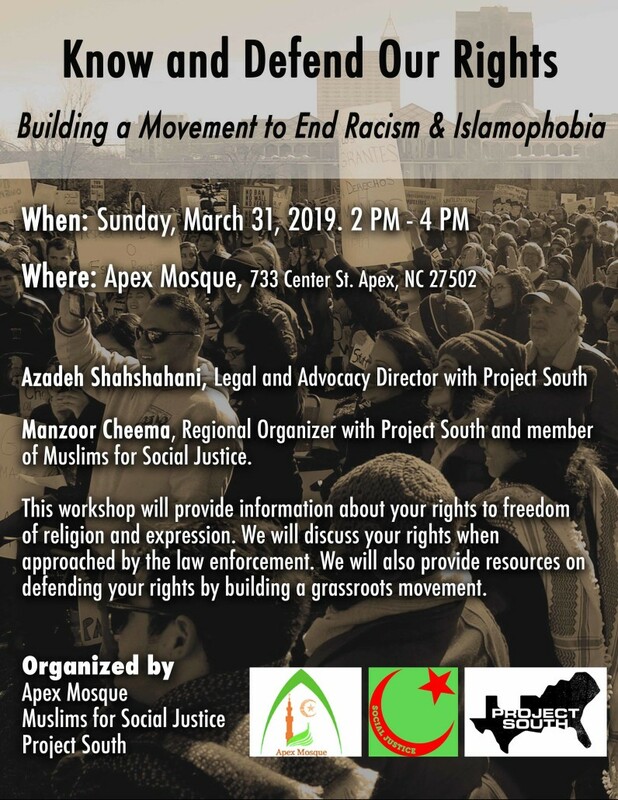 The Apex Mosque is once again partnering with St. Michael’s Episcopal Church in Raleigh to package meals as part of a Rise Against Hunger event. Rise Against Hunger is an international hunger relief organization that distributes food and life-changing aid to the world’s most vulnerable, mobilizing the necessary resources to end hunger by 2030. The event will take place at St. Michael’s Church, at 1520 Canterbury Road, Raleigh on Sunday, 17-March from 2 to 4PM and will consist of packaging meals through an assembly line process. Families including children as young as 4 years are encouraged to participate. Donations are encouraged but not required. For more information and/or to register, please visit HERE.